Friends who share a love of baking and cream-filled pastries dipped in chocolate ganache warmed up a rainy afternoon in our kitchen north of the Arctic Circle. Perfectly turned out pastry puffs filled with delectable cream and dipped in chocolate ganache are the the stuff of home bakers’ dreams. Cream puffs and eclairs require a special dough called pâte à choux. Worked to exactly the right consistency, this dough bakes up light and flaky and leaves a hollow space in the center of the confection. Although we used traditional vanilla-flavored pastry cream, we also imagined filling these airy profiteroles with fresh whipped cream, homemade ice cream and even savories such as smoked salmon cream. 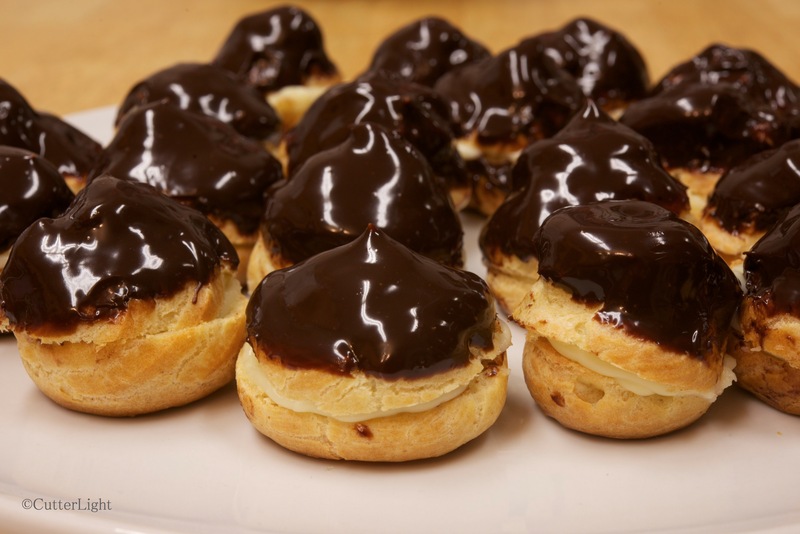 Making cream puffs and eclairs can’t be rushed. The pâte à choux dough requires time and attention in order to get it to the correct consistency as it cooks on the stove top. Next, it must be carefully piped onto a baking sheet and placed in the oven where it will finish. Creating the pastry cream is fairly easy, and making chocolate ganache is magical. All that work, and between three bakers, three tasters and steaming mugs of of rooibos almond tea, our eclairs and puffs disappeared in short order. Line two baking sheets with parchment paper. Preheat oven to 400 degrees F.
Pour milk and water into medium pan. Stir in salt and sugar. Take mixture off heat and stir in all the flour. Mixture should look like mashed potatoes. Return pan to low heat and stir continuously. This will dry out the dough a little. Dough should come together to form a ball. Starchy residue at the bottom of the pan is an indicator that the dough is dried out enough. Take dough off stove and place it in the mixing bowl of a stand mixer. Turn it to low to allow the dough to be cooled off by the mixer. Mix in eggs one at a time, watching that the dough does not become too thin. The dough should be soft, creamy, and shiny. Transfer the dough to a piping bag with a large tip. Pipe ball shapes onto parchment-lined baking sheets, leaving plenty of room for these puffs to double in size. Bake puffs for 10 minutes. Turn oven down to 325 degrees F and continue to bake for 15 minutes. Fill with chilled whipping cream or pastry cream – savory or sweet. Again, great shot, Bar. Those look delicious! They remind us of the peaches we had in our tree. They were so juicy they would drip down your arm as you ate them. No, but seriously, put those on the menu for when you guys get back to Seward for the summer. Who DOESN’T love profiteroles…? YUM! And profiterole is so fun to say!